Tonight, I announced at our annual book awards and industry appreciation party that 800-CEO-READ has selected What Works: Gender Equality by Design by Iris Bohnet (Belknap Press) as the 2016 Business Book of the Year. Awards can be seen as an immortalization. In honoring a book, we run the risk of fossilizing it as well, taking the book out of the real world and making it a relic of the year. We want to make sure that our elevation of What Works amplifies its importance, and extends its lifetime, rather than relegating it to history. Books, and the ideas in them, must live and breathe, affecting the world with their presence in it, and we believe that is especially true of What Works. To be fully honored, Iris Bohnet's methods must be put into practice. So, while we believe What Works was indeed the business book of the year in 2016, we also hope others find it’s the best business book for them and their organizations in 2017, and ’18, and on, and on… until gender equality is realized. Our collective future depends on it. With every new year comes an influx of new ideas on how to break old habits. We commit to exercise more, resolve to spend less money, promise to be home on time for dinner, volunteer more frequently, and, always, eat less food. Course corrections, we might think of them. We believe we’ve strayed from the path—the path to health, to riches, to a happy family, to a smaller pair of jeans—rather than knowing we must carve our own simply by walking it. At this time of year, it appears that humans are geared toward being perpetually striving, believing ourselves to have the capacity to become better humans if only we put in the right amount of effort. And the new year is the mystical epicenter of our ambition, the time when we believe we can access our better, more thoughtful, disciplined, focused selves—like a vortex opens on New Year's Eve and all we have to do is step through and conjoin with our better selves. I don’t intend to denigrate that impulse. To be honest, this pursuit of change, of progress, is at the heart of what 800-CEO-READ does. If human beings weren’t ambitious and, well, dissatisfied, the books we ship around the globe in the thousands wouldn’t need to be shipped around the globe in the thousands. We sell books that guide, advise, and hopefully change minds—maybe even hearts. And yet, for such inveterate individual strivers, why is it so hard to expect people, as a group, to reach for their best iteration? Why do we shrink back from expecting the human race to work, collectively, for good? You might be reading this, thinking, that’s not me! I want each person to be their most creative, productive, empathetic self. But the reality is, whatever you, as a leader, as a protester, as an evangelist, define as progress unmoors others. And unmoored people? Well, they like to clutch their proverbial pearls, their door handles, their way of life. You've seen it in your personal life: what happens when you make commitments to eating better and desire for your family to do the same? You clear out the refrigerator and empty the pantry of those items you don't want to be tempted by; but your family members balk and soon there are Little Debbie's Oatmeal Sandwiches on your shelves and Ben and Jerry's in your freezer once again. What happens when a nation defines progress in terms of inclusion, and then a backlash by those who feel displaced and fearful yanks the leash? In an ideal world, paths to progress would be linear. One step in front of the other, rather than 2 steps forward, one step back. But straight paths aren’t easy to come by, and there are endless reasons why. We can blame tribalism and groupthink. We can blame systemic problems that can't be solved by any one person or one generation's effort, or hegemonic fallacies that can't be unlearned or disbelieved just because we question their validity. We accuse individual people of being complicit, for being biased, of being proverbial ostriches. There's plenty of blame and judgment to go around. Change is hard, whether on the personal, organizational, national, or global level. And it can be disheartening. In fact, it can be heart-breaking. But here's the thing. When we are forced to take that step back, after believing we've come so far, it's also an opportunity to ask why. We can choose to treat stumbles as an opportunity to refuel and reengage. All we need is a new idea, a different way to frame the problem, a different kind of tool. And Iris Bohnet, in her book What Works, presents a method for redesigning walls by chiseling away at the biases the continue to restrain equality in the workplace. Far from all gender inequities are the result of unconscious bias, which is only one of the culprits unjustly disadvantaging some and benefiting others. And behavioral interventions are one instrument in our collective toolbox to correct for these injustices. Biases are, however, a clear cause of inequality, and behavioral designs can accomplish things that hammers cannot. Generally speaking, the challenge with systemic disadvantage is that the onus for creating change or methods of change has lain at the foot of the disadvantaged. In other words, women are, rightly I think, encouraged to lean in (Sheryl Sandberg) or relearn the way they hold themselves physically (Amy Cuddy) or join forces with the other women in their offices (Jessica Bennett) or dissect the code for confidence (Shipman and Kay). And individual change can compel mass change that generates momentum. This has been the approach of feminism for some time. Still we get stuck on how to make it stick. We protest, we take a seat at the table, and yes, sometimes, we fight back. But, how do those individual acts truly move the needle in the face of such age-old and creaking resistance? We found What Works to be that instrument, the one that will help us improve our organizations beyond good intentions or punitive action. As Ryan Schleicher, auditor of the Big Ideas and New Perspectives category of our awards, says about What Works: “Iris Bohnet’s book presents perhaps the most comprehensive roadmap ever written to making equality in the workplace a reality.” Why? Because Bohnet’s theory that dismantling our biases is the only way toward long-lasting change offers us a way to change the recipe rather than just garnish the plate. Often, we do not realize that we are biased, and even more often we do not receive feedback in time to link a specific decision or behavior to our bias. And even if we do, we may well not act on the information received. Put bluntly, changing behavior means work that the vast majority of us are not motivated to do. And yet, there is enough evidence, as laid out in What Works, that says gender equality, despite our resistance, benefits everyone at every level of the company. Women get more opportunity; managers have access to more talent; leaders get an influx of new ideas; shareholders profit from those improvements. It is to the detriment of the company if a leader, manager, recruiter, or team member relies on untested assumptions and lets his or her biases go unchecked. Yes, this self-analysis must also include women. It’s not simple enough to say that all women want the same thing, or at the very least, want every woman to have access to her desired opportunity. Even women, as Bohnet details, often have to confront their own stereotypes about what constitutes women’s work, about women’s place. Stereotypes serve as heuristics—rules of thumb—that allow us to process information more easily, but they are often inaccurate. What is worse, stereotypes describing how we believe the world to be often turn into prescriptions for what the world should be. 2016 was a year when we were reminded that our society isn’t quite ready to abandon its bias against women as leaders, no matter how experienced. Bohnet explains that women who strive publicly “violate norms, and people do not find norm violators appealing." But we are people wired to pursue change, to progress toward what we believe is best for us, our families, our organizations, our nation. Still we struggle to think independently. It takes deliberate effort and courage to contradict your tribe and come to conclusions based on fact rather than via confirmation bias, which Bohnet refers to as "one of the most challenging obstacles to smart decision making." When people search for and assess information, they tend to favor evidence that confirms their existing beliefs. But it keeps them from assessing new information objectively. Indeed, it impedes their ability to learn. In other words, if in 2016 you found either presidential candidate untrustworthy, no doubt you would invest in the reports of their untrustworthiness. One can ask: who might be motivated at all in seeking out sources that contradict their existing beliefs? After all, we derive comfort and inclusion by remaining one with our tribes, in feeling right alongside grouthink. But if we want to make unbiased decisions, if we want to be better, then we must. What Works makes this clear. To change, we must will ourselves to invest in the process of changing. 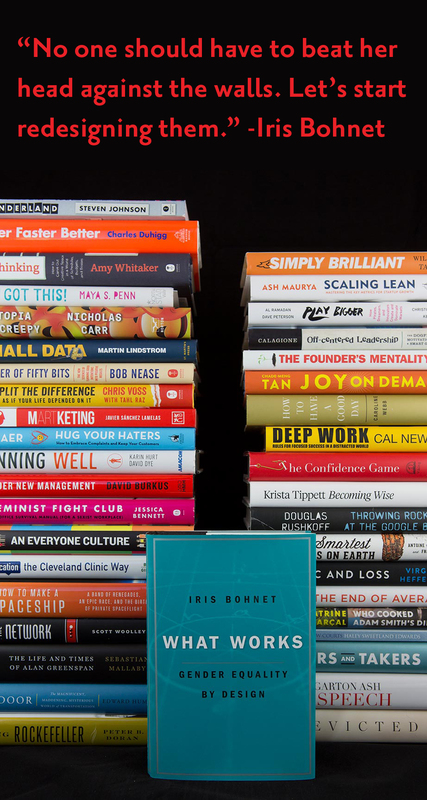 I first reviewed Bohnet's What Works in April, because I believed the book to offer an unparalleled kind of strategic and executable value for any organization that believes true success only comes when everyone has an equal voice. Now I believe that Iris Bohnet’s book offers a framework to solve the even greater problems our communities and nation face once again with regard to the freshly exposed deficit (and/or impending decline) of equality for women. There is no better recommendation I can think of for awarding What Works our Best Business Book in 2016 award than that this book will reach beyond the confines of the traditional workplace and change the way women's work is valued at every level. Only when that work is done will Iris Bohnet's book have its rightful place in history.